Rome…if it’s not on your bucket list, it should be. Of course, we were hitting it at the end of our trip which meant we had been travelling for the better part of three weeks out of just a couple of carry-ons, and walking 15 to 20 thousand steps per day on uneven cobblestone streets. Couple that with drinking aperitifs before dinner, Italian wine with almost every meal and of course enjoying the hell out of most meals, so we were getting pretty tired. Frankly, we were both ready to call it a day but then we got to Rome, the Eternal City. Rome is full of so much history that you could probably live there a lifetime and still not see it all. Ken is a huge history buff and got excited all over again. Karen rallied some but was still ready to be home. Each cool thing in Rome was matched by thoughts of being in her own bed at home. Three weeks is a long time to live out of a suitcase. It was in Rome that we had “gullible tourist experience number three”. We had been warned about the taxi drivers in Rome overcharging and had even been told of their favorite tactic…not resetting the fare meter from the last ride when they pick you up. Despite all of my best efforts to see it when we got in, the Taxi driver was apparently a master magician as well as a part time race car driver because he managed to hide it from me rather effortlessly every time I tried to look, all while careening around Roman streets like a lunatic. Not knowing what the fare should have been when we reached the hotel and not having any proof to call BS, we paid it and found out two minutes later when we checked in at the hotel, the driver overcharged us by 25 euro, roughly double the rate that it should have been…more on this later. If we listed all of the sites that we saw in Rome, wanted to see prior to the trip or learned about once we arrived, this post would take a week to write and by the time it was finished, there would be a hundred more blogs on Rome on other web sites. All of the famous places that you’ve seen in the movies, read about in books or heard about from TV…the Colosseum, the Circus Maximus where the chariot races took place, the Trevi Fountain, Vatican City, St Paul’s Cathedral, the Sistine Chapel, the Pantheon, Castel St’Angelo, underground ruins and miles of above ground Roman ruins….we saw it all over four days. Instead of turning this into a novel length post however, we’ll concentrate on the more unusual or underappreciated stuff that we saw and did. We stayed at a small hotel which thankfully had really good air-conditioning. It was a warm summer in Italy and the further south we went, the hotter it got. We spent so much time in the sun that Karen’s normally medium blond hair was turning really light…almost white like it was when she was a kid….all with no added chemicals or mess. There you have it folks…if you want to lighten your hair naturally, just fly to Italy in the summer and walk around in the sun for a few weeks. It’s completely natural but perhaps a touch more expensive than “color in a box”. 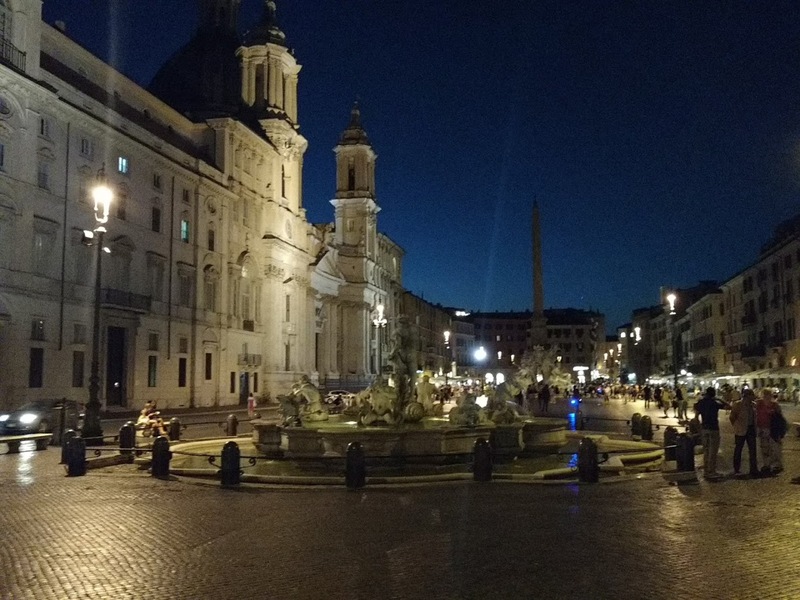 The hotel was just a couple minute walk from Piazza Navona which is a great location. Piazza Navona is pretty cool on its own and it’s only a 15 minute walk to the bridge leading to Vatican City. There are also underground Roman ruins right under the buildings bordering the Piazza so there is plenty to see in the immediate vicinity. 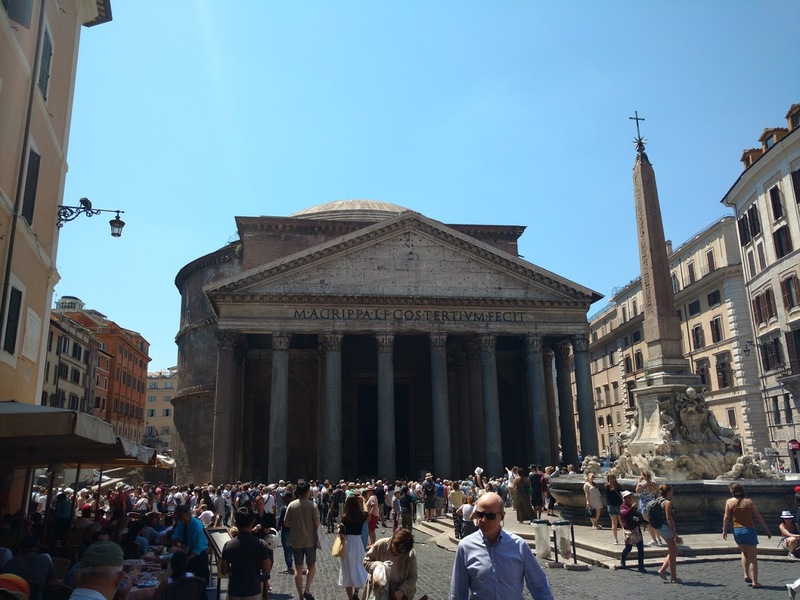 The Pantheon is also only a 5 minute walk away. The Pantheon is not as well-known as many of the other historic buildings in Rome and I’ll be damned if I know why. The history is fascinating, the building is stunning and it is an architectural marvel that has been in continuous use for almost 1,900 years. Ken visited it twice because the first time, there were so many people packed inside, is seemed more like a winding line at the DMV than an historical building of stunning antiquity. A visit early the next morning when it first opened was much more enjoyable because the place was almost empty. 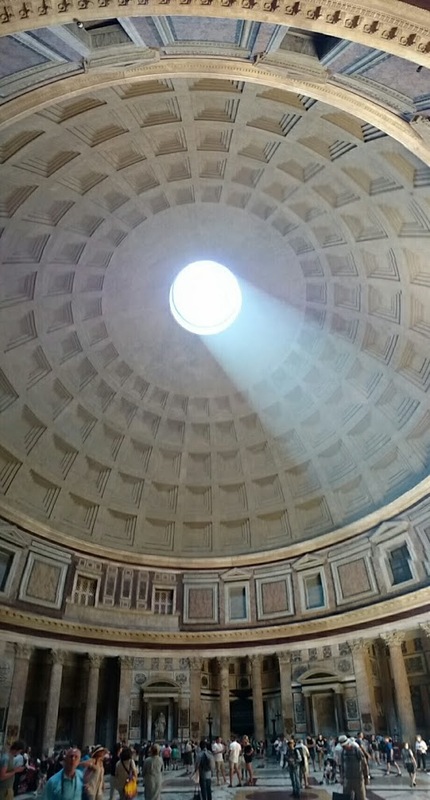 Sunlight Thought The Oculus In The Pantheon In Rome. Ken Was Fascinated By It. One of the highlights in Rome was a walking tour with a great local guide through some of the lesser known areas of Rome that started ironically enough, at one of the best known, the Piazza in front of St. Peter’s Basilica in Vatican City. We walked on the lesser visited, western side of the Tiber river up to Parco del Gianicola. It doesn’t show up on very many “must visit” lists of Rome but it should because the views are fantastic. It’s also a great way to enter the famous and historical Jewish Ghetto of Rome where our local guide said that some of Rome’s best food is served. Our last stop on the tour was at a huge store called “Eataly”. We had seen a couple of these and thought they were just gimmicky tourist traps but our guide said the exact opposite was the case. The store that we visited was like a huge Whole Foods, specializing in all things Italian, from pasta and sauces, seafood and meat to beer and wine. It also had four different restaurants inside so we took our leave from the guide and had a couple of really nice pasta dishes. We hadn’t tried any local Roman wines and unfortunately, we weren’t overly impressed with any of them. Rome isn’t one of the acclaimed wine regions in Italy and now we know why. We had walked about 25,000 steps on hard pavement and cobblestones that day so we called for a taxi instead of walking home. Not wanting to repeat a mistake from day one, I asked what the fare would be and the driver picked up on the fact that we had been scammed. The fare was very reasonable and he was very upset because according to him, most of the taxi drivers are scrupulous and they are trying to eliminate the slime-balls like the first guy that overcharged us. He wanted the name but unfortunately, after seeing so many Luigis, Francescos and Peitros, we couldn’t remember it. Rome has so many museums that it’s impossible to see them all but one of the best is the Borghese Gallery. Its list of famous artwork is virtually unending and they do a good job of keeping crowds down by only accepting visitors with reservations. Walking sounded like a good idea until we got most of the way there and realized it was the hottest day of the trip and the gallery is up a pretty serious hill. At the top, just before entering the park where the Gallery is located, is an ancient Roman wall. No problem for the modern day Romans. They just built the road through the wall. It was pretty cool but getting across was also a bit like playing the video game, Frogger, with us as the frogs. Our last day in Rome was spent visiting the obligatory tourist places, the Colosseum, the Arch of Tiberius and all the other ancient Roman sites. 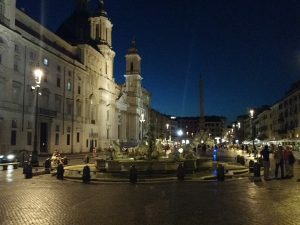 After a long walk back to Piazza Navona, we split a pizza, shared a last bottle of Prosecco and went back to pack and ready ourselves for the long journey home the next day.